The weather was changing for the better real quick. We took off the helmets and got ready for the first G7 location of the day. I have been aware of J. E. H. MacDonald’s “Morning, Algoma, Agawa Canyon” and had planned to stop at the end of a short easy Class I when I realized that the higher water would stop us from doing that and stopping further downstream the view would have been blocked by forest growth, so we quickly beached ourselves in the shallows. You can tell by the water the area from where JEH painted from was a little wet today. We managed to park ourselves just about upstream of the little piece of land where it juts out in the painting on the left side of the painting. Safely landed and getting ready to compare images of the painting to our location. Jim’s pic of Sue and Sandi checking out the location. Sue was real excited to see the ACR Mile 114 mileage marker from the river. So with a little B & W fun and take her back in time. Sue & Sandi In JEH’s painting, then Jim and I. We made a quick stop at Canyon station when we saw the “Moments of Algoma” interpretation G7 signs. It just so happens that one of my pictures from one of my past trips is on it so it was time for some selfie pics! What was funny is that when we did Sue and Jim’s pic he wanted the hills in the back ground. With the sun now out, it would make for some great viewing of the G7 locations in the Canyon Station section. Once out on the water we encountered a natural phenomena, the wind tunnel effect. The wind was blowing straight up the river so hard there was whitecaps and paddling into the wind was difficult. We hugged the shore lines for a bit of protection but we made a couple of ferries to cross the river for different views. This is Jim’s pic of South Black Beaver falls from the eastern bank. I had to hold on to the brush along the shore to stabilize the boat. We then Crossed back over to get the views of two G7 locations of Bridal Veil Falls. The little side falls on the left of the paintings only runs in High water now. Jim’s Photo from the Canoe. Sue and Sandi paddling in to another painting. Notice the wind generated waves, once we were closer to the falls it was really quite pleasant. Jim heading into the scene. Once here you just have to paddle up close and personal to the falls and the way the wind was blowing the mist towards the falls you could get much closer without getting wet on a cool day. We then tucked ourselves into a little protected area on the south side of the falls and discussed several other locations here. Link to J E H painting “Falls on the Algoma River” This is a view of Bridal Veil Falls from the south side where it joins with the Agawa river. Again the little ribbon of falls only flows in high water. Sue & Jim taking the view in. We did not do the hike to where the painting was done but this shot from the north side of the falls shows just how the water flies off the canyon wall. We were able to get this shot because the wind kept the mists away! We got Jim up close and personal too! We left our little protected zone and head down stream to an AY and JEH location. It is also of Bridal Veil falls, just from a different angle. Sue was happy that she could see the location where Frank Johnston painted from, but I don’t think her and Sandi were happy the extreme wind tunnel effect that was taking place. We heard the tree breaking in the wind on the canyon wall, Sandi and Sue got to watch it. Make no mistake, it was a very tough paddle against the wind. Sue and Sandi going against the wind. We were able to tuck in behind a large boulder in the river to act as a wind break. Judging from the painting this would have been a fairly recent rock fall when they painted it, which makes it a great recording on how the vegetation grows back after an event. The position that they most likely painted their view from is now obscured by trees, but this is equally impressive! Against the wind the short paddle to the next rapid seemed a lot longer than it was. But just before the spot we dropped Sue and Jim off to walk the rapid the wind became a gentle breeze. Such is the weird way winds can happen in the canyon. The rapid is a Class III known as “Good hope” it is only 450 m long but the difficulty is all in the last 100m. At this level there is a move through a narrow gap on river left and then having to move very quickly to river right to avoid an almost river wide sieve of boulders. We then stopped at the rail way trestle at Mile 112 for a snack. The flood from Sept. 5th made the sandbar much smaller than last year. He does have access to some great views. Looking north from the bridge. Once on our way Jim was intrigued by this view and asked me to take him into the rocks. The next rapid is only about 180m long with the first 2/3 Class II but then ends in a Class III boulder garden where wrapping your boat is a real possibility. After we ran it this is the view from the bottom, it also happens to have a cliff face that is in a AY painting. After Sue and Jim got back in the canoes, this would be the best views of the cliff faces we would have on this trip. Photographs really don’t do justice to the size of the cliffs here, but it really is wonderful eye candy as you paddle through. There is a good size of pool and then a long 700m long Class II, what makes this rapid “interesting” is except in even higher flows than what we had is there is a lot of maneuvering and it is very easy to get stuck. Paddling rock garden rapids is a little different from paddling rivers with easy to recognize channels. Sue and Sandy, were both were very cool through the whole thing. Thanks to Jim we had the whole episode photographed. We actually were paddling fairly close together and when I saw them getting stuck it took about 50m to get to a spot where I could the canoe to fit through the rocks, get out and leave Jim secure. Even though it looks shallow there are some pretty deep holes in there but the river here is much wider than it looks in the pics. In lower flows I get stuck in this rock maze all the time. In the featured image at the start of this episode Sandi has attached the throw rope and tossed it to me on my perch, which while trying to get there, fell into one of those holes which was chest deep. All I had to do was pull the boat backwards. 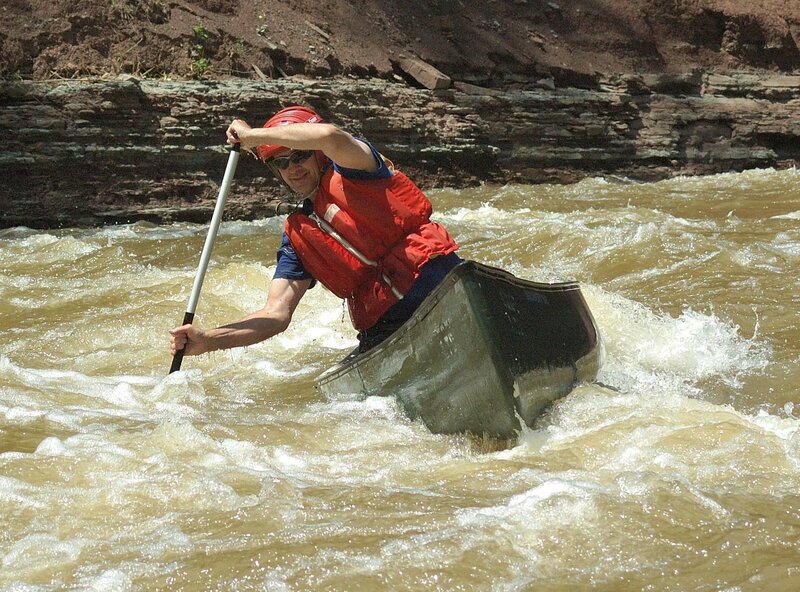 Once free of the rocks and just let the canoe swing into a better place. We were starting to run late into the day so Sandi rock hopped down to Jim and I re-bagged the throw rope and bounced the rest of the way down with Sue. As for Jim He got a great pic of one of the biggest cliff faces in the canyon, which is over 200m tall. It also just happens to be the back drop to several G7 locations, some that can no longer been seen from where they were painted but the cliff face is always impressive. The image also shows just how rock strewn this rapid is. Here is my image when we were right underneath what we thought was in the painting. But the Day is not over yet, there was a long Class I rapid then a long pool as we enter Lake Superior Provincial Park and the campsite where the Little Agawa River joins the main Agawa. We worked on getting the tents up so they could dry a little bit since they were still wet from breaking camp in the morning. It was really fun watching Sue and JIm getting really excited about this spot and what made it even more special was even before we were completely set up we got near perfect lighting and photo conditions and water levels to match Lawren Harris’s paintings. No special filters, no processing tricks, just as it was and still is! All in all it was a great day 3, the forecast from the morning was reasonably correct as it did get warmer all day and was quite pleasant this evening. This time we were much faster in getting the tarp up…. but there was no magic in getting it up early.